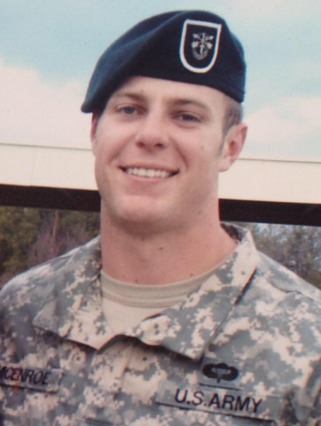 SSG Kevin J. McEnroe was born on July 8, 1986 in Tucson, Arizona. He enlisted in the US Army on April 17, 2008 and attended Basic Training at Fort Benning, Georgia. He later attended and graduated from the Basic Airborne Course on September 6, 2008, and then attended Special Forces Assessment and Selection at Fort Bragg, North Carolina. He graduated from the Special Forces Qualification Course as a Special Forces Communications Sergeant on December 16, 2011. SSG McEnroe then served in 3rd Battalion, 5th Special Forces Group (Airborne) Fort Campbell, Kentucky. SSG McEnroe deployed five times, supporting Operation ENDURING FREEDOM and other contingency operations. SSG McEnroe’s military education included the Combat Diver Qualification Course; Special Operations Terminal Attack Controller Course; Special Forces Qualification Course; Advance Leader Course; Basic Leader Course; Survival, Evasion, Resistance, and Escape Course; and the Basic Airborne Course. SSG McEnroe’s awards and decorations include the Army Commendation Medal, the Army Achievement Medal, the Army Good Conduct Medal (2nd Award), the NATO Service Medal; the National Defense Service Medal, the Afghanistan Campaign Medal with Campaign Star, the Global War on Terrorism Expeditionary Medal, the Global War on Terrorism Service Medal, the Noncommissioned Officer Professional Development Ribbon (Numeral 2), the Army Service Ribbon, the Special Forces Tab, Combat Diver Qualification Badge and the Parachutist Badge. SSG McEnroe is survived by his mother, Linda Frost of Tucson, Arizona, his father Brian McEnroe of Bradenton, Florida and his two brothers, Nicholas and Christopher McEnroe of Nashville, Tennessee.